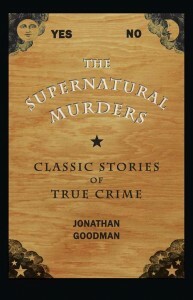 This anthology of thirteen true crime stories includes the mysterious slaying of Charles Walton, who was found slashed and pierced to death in an area notorious for its associations with black magic; the murder of Eric Tombe, whose body was located because of a recurring dream in which his mother saw Eric down a well; the terrorizing of Hammersmith, London, in the early nineteenth century by the nocturnal appearance of a “ghost”; the Salem witchcraft trials; the murder of Rasputin, who was believed by some in Russia to be a miracle worker and by others to be a dangerous charlatan; a Scottish tale in which evidence given by the ghost of the victim was allowed at the murderer’s trial; and the bizarre goings-on at 112 Ocean Avenue, Amityville, New York, where Ronnie DeFeo Jr. murdered his entire family—the new occupants were subjected to all manner of sinister events, including the presence of poltergeists, or were they? Jonathan Goodman, considered to have been Britain’s leading crime historian, died in January 2008. After service in the RAF, he began his career in the theater, working first as a stage manager and then as a producer. While with the theater in Liverpool, Goodman, who had already written a crime novel and the entertaining Bloody Versicles (reprinted in the United States by The Kent State University Press, 1993), an anthology of rhymes in crime, researched the celebrated case of William Wallace, who was convicted in 1931 of the murder of his wife Julia. The Killing of Julia Wallace (1969) was a great success, and Goodman’s career took off. The Kent State University Press has published Goodman’s The Passing of Starr Faithfull (1996), Tracks to Murder (2005), and Murder on Several Occasions (2007).